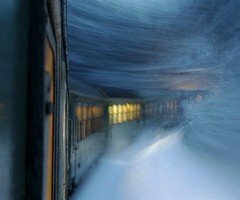 She boarded the train just after midnight. Not her usual mode of transportation, but being in a rural area...this was the only option for reaching a major airport. Sitting alone, watching the country-side fly by, becoming a kaelidoscope of black, gray, purple and silver, she reflected on her life. Completely absorbed in thought, it took a moment to realize someone was talking. "Excuse me," she said to the elderly gentleman who was beside her. "Are you ok, my dear? "You seem a million miles away and you are crying!" he said with gentle concern. Not one to exhibit emotions in public, she touched her face and found a salty wetness of her tears. Like coming to the surface from a deep water dive, she couldn't focus on what he was saying. At last she understood this simple question, "Where are you going at this time of night?" "Home," she said, with no explanation. A piece of flash fiction developed from a writing practice prompt.